Wireless apparatus for signalling hits in fencing, suitable for epee andfoil training. • Not suitable for competitions since not all features of a traditional wire apparatus can be guaranteed. Signalling specifications are indicated in the “WF1-Signalling Specifications” document – which can be found here. • Signals hits in conformity with FIE time regulations. • Ready for immediate use. Ideal for gyms or schools which are not equipped for fencing since no installation/uninstallation of reels, cables, apparatuses and power supply devices is needed. • Used with customary fencing attire and equipment. • Operates with rechargeable batteries. Typical length of battery life: approx. 45 hours of power. Battery level indicator. Auto-switch off after 20 minutes of inactivity. Battery charger provided. 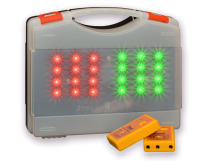 • Excellenct visibility of the lights signalling hits. Adjustable acoustic signal. • A second WF1 can be used as a repeater on the same piste, in order to display hits at each end of the piste or in the direction of the spectators. • Radio transmission at 2.4GHz. Simultaneous operation of 12 piste without interference thanks to the possibilty of selecting 12 different radio channels. Such a selection allows for the TRANSMITTER to be easily replaced without having to specifiy any codes to the manufacturer. • USB port for easy updating of software in the case of changes in FIE regulations. For automatic updating simply insert a USB key containing the new file. • Comes with carrying case with transparent side containing: RECEIVER apparatus with signalling lights, the two TRANSMITTERS used by fencers, and battery charger. All Favero scoring products can be viewed at www.favero.com. We will quote on all Favero items below their direct retail price (which are shown on their website minus Italian VAT which is 21%). 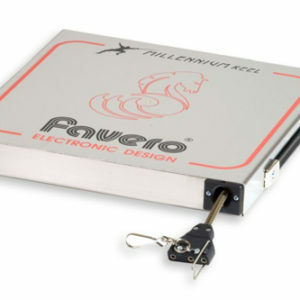 This product is ordered from Favero and sent to you directly, this will take 2-3 weeks.